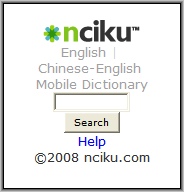 Nciku Mobile (m.nciku.com) is an English/Chinese, Chinese/English online mobile dictionary. It’s a simple but effective tool providing translations of English words into Chinese and vice/versa. Nciku supports entry and display of simplified Chinese characters and Pinyin, the familiar representation ( Beijing and Ni hao, for example) of Chinese in the Roman alphabet. In addition to literal translations to and from Pinyin and Chinese characters, Nciku provides phonetic pronunciation of English words and examples using the translated words in sentences. Nciku has an English user interface However, the site displays Chinese characters using double-byte characters rather than images so they don’t appear on most Western handsets. To make the most of Nciku you really need a phone with a Chinese language pack so that you can see (and enter, if your know how) Chinese characters. This entry was posted in Translation and tagged Chinese/English Dictionary, English/Chinese Dictionary, mobile site review, online mobile Chinese translator by Dennis Bournique. Bookmark the permalink. I like it and want to use offline. Nciku is a Webapp that can’t work offline. Check you platform’s app store for an English/Chinese dictionary app that works offline. There is an application which translates emails and other texts for BlackBerry http://home.interlecta.com/mobile Also supports Chinese Traditional and Simplified but it is better for users who do not speak Chinese at all. It is quite difficult to use a dictionary and try to communicate when you don’t know even the alphabet. I live in Shanghai and have not been able to open http://www.nciku.com all day (I use this extensively at work and am worried about my day tomorrow). I’ve tried on firefox and explorer – neither work (nor does http://www.m.nciku.com). Strangely enough I can access nciku.com on my blackberry (but it is not the BB/Mobile site). I was able to contact Kevin at Nciku and he has resolved the problem, m.nciku.com is working again. You are right, I just tried it and got h863.com too. I’ll email the site owner and see if I can this resolved. The link m.nciku.com takes me to h863.com. What’s going on? Thanks for the update Kevin, I’ve corrected the post and removed the reference to Traditional characters. Thanks a lot for the review and the link. I just want to correct one point though – we actually only support Simplified Chinese (the form used in Mainland China and Singapore) at the moment, although we are working on adding a Traditional character version as well.